How about squash with squash? How about squash with squash in a squashy sauce? How about squash with squash in a squashy sauce...with a side of squash? That's what my family more or less ended up with for dinner the other night, due to my brilliant planning. But I'll limit my guiltiness to only the last part of "a side of squash." Hey, without thinking too hard, some zucchini sounded like a great idea to go with our Trader Joe's Harvest Spaghetti Squash Spirals. Probably shoulda gone for some leaft greens or something instead. Oh well. Everything else though? That's all Trader Joe's Harvest Spaghetti Squash Spirals. Sorry for the cruddy pic, I just got a new better camera but still figuring out how to take pics of shiny packages. 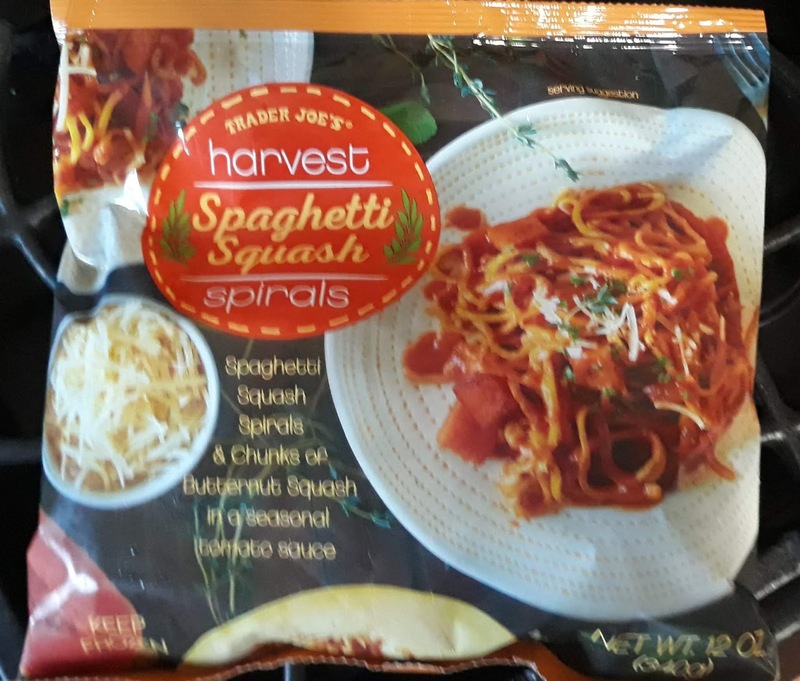 So in case the description on the front is unclear, it says spaghetti squash spirals and chunks of butternut squash in a seasonal tomato sauce. "Seasonal tomato sauce" paired anywhere close to "harvest" with a TJ's item is a code for pumpkin puree being involved, as is the case here...pumpkin is like an honorary squash, right? So it's squash with squash in a squashy sauce. Period. At least there's none of those purported "spices" really bandying about in here. Wish I could say I liked it more. It's not an awful product, and I kinda like the presentation. 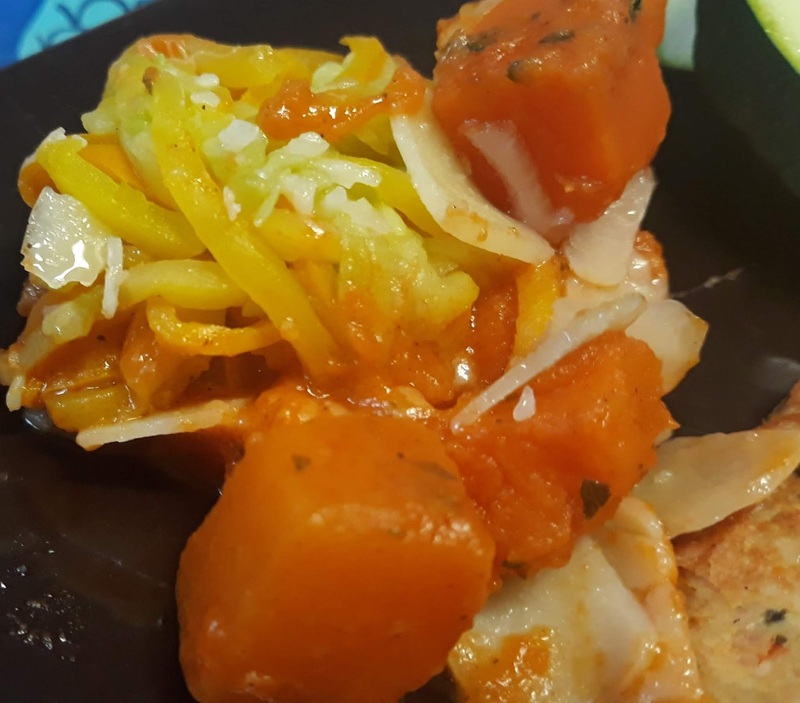 Our particular frozen package contained four small squash tumbleweed/bird nest type deals which heated quickly on our stove top, and combined well with the sauce and butternut squash chunks when added. All the squash was on, or on enough for a frozen product - the spaghetti was mild and firm, and appropriately noodley, while the butternut was soft and sweet with a good touch of earthy. The sauce was a little sparing, as I would have liked more, as I feel it didn't offer much one way or another. 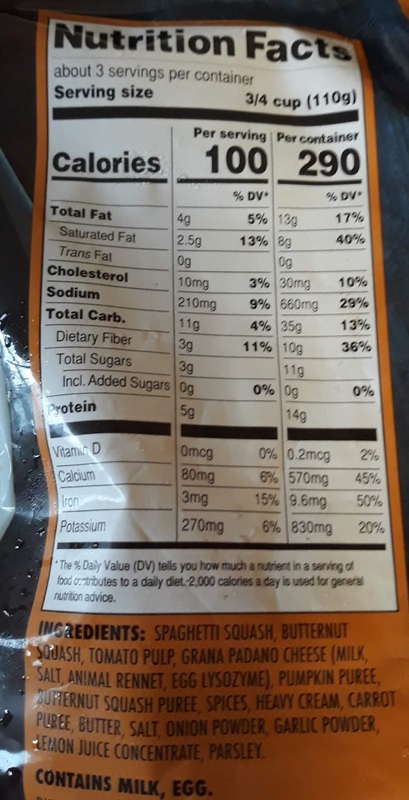 Although pictured on the package as small shreds, the cheese on top came out as large flakes, and was a highlight. We love our Parmesan-esque cheeses here. Still, there was something that felt lacking or at least not compelling. The spirals were small enough to leave us wanting more, so maybe that's part of it. Or maybe it just wasn't our favorite presentation...we're admittedly more of a roasted veggie kinda fam. Still, for relative ease and convenience, with an acceptable price tag of $2.99, the squashy spirals are a decent enough product. Just don't expect to be wowed. I think maybe u could roast these slightly and add to tomato soup? I'm doing WW and the whole bag is 11 points. I was going to make their cauliflower gnocchi with their vodka sauce but that was 16 points and I NEEDED to leave room for wine tonight... so I went with this with some added protein and veggies and I'm eating it now and utterly delighted.